Match seed size with mesh size when ordering (mesh size is correct when seed can be pushed through mesh with slight pressure). Socking can be filled by hand or with high speed socking table. Socking can be hung by individual droppers or by the continuous method from longline or raft. Socking is knitted which means stress is distributed to many strands and won't run or rip like oriented plastic can. Its knitted design has many strands for byssal attachment. Can be harvested by hand or mechanical harverter. 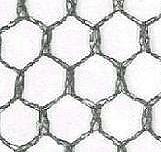 Socking is easier to fill because of regulated stretch width and a variety of mesh sizes are available to suit the industry.